The MZ Gun series are swirl/spray and are used in labeling and non woven applications. The MZ Guns are “air open and spring closed” and use the CF-200 style gun module. These applicators can be used with general packaging grade and PSA Pressure sensitive adhesives at temperatures from 93°C(200°F) up to 190°C(375°F). The MZ Guns require 2 valve signals for proper application. One signal operates the valve activation of the fluid module and the other signal operates the swirl air which enters through the gun below the fluid port. These guns have an air heating grid machined into the bottom of the gun that supplies heated air for the swirl activation. This helps ensure that the swirl pattern is accurately placed and helps control the stringing or “angel hair” that is commonly produced with spray/swirl applications. The MZ Guns can be configured in various spacing configurations for any required application. Each ME Gun is configured with a 220-240VAC heater cartridge. 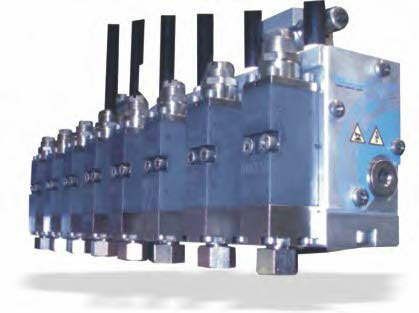 The wattages vary depending on the size of each manifold. The standard heater OD is ½”. The MZ Guns come standard with a clamp for ½” round bar or hex bar stock. There are 3/8”round bar bracket clamps available and can be purchased separately. If additional brackets are required, please request as additional item. All MZ Guns require special hoses that contain a ¼” air tube inside the hose that helps heat the air that is required for the swirl activation. Most MZ Guns do not come with solenoids and must be ordered separately. Each MZ gun will require regulated air to both solenoids. Make sure to include 2 solenoids and 2 air regulators for each MZ Gun being installed. If multiple MZ Guns are being used, you can split the air from each regulator to operate multiple swirl modules and swirl air control. The solenoids are 24VDC and can be fired from any PLC and/or most existing pattern controls.